So today I'm doing a goals post, which I have never done before on this blog. These are some of the things I want to achieve or do during July. I feel a little bit stuck in a rut at the moment so I want to sort of shake things up and try to do a lot of new things. Setting goals on how many followers you have on social media may seem shallow but I feel that growing your social media is super important as a blogger. 500 probably isn't a large amount for some but hey baby steps and all that. I'm thinking of down grading my posts to only two a week as I sometimes feel like I put out content of less quality just in order to stick to my schedule. I'm thinking of posting on Mondays and Thursdays now. I don't mean join a gym or anything but I really want to go on more walks and get into playing tennis and badminton again. I want to have a sit down with myself and have a big think. I want to think about my future, what I want and the best ways to achieve it. I don't necessarily have to come up with any answers as long as I have a good think. I love being creative and making things but I rarely do it any more so I want to start creating and putting up DIYs and recipes on In Ella's Element. I love art and I love discovering new artists by going to exhibitions so I want to find an exhibition and go to it. I want to try at least one new food this month I have no clue what or where but I really want to try something new. If you have any recommendations please let me know. 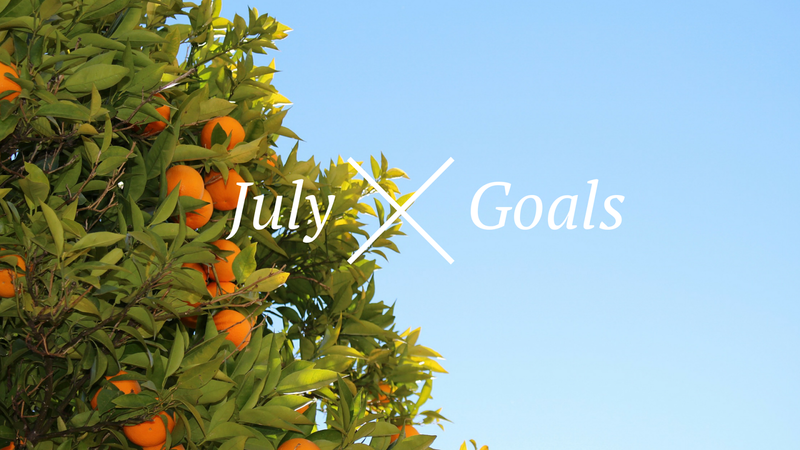 So those are my goals for July I hope you enjoyed reading this post. Do you have any goals similar to mine? What are your goals for July? Oh wow! This sounds really good, I'll have to give it a go! Thank you for the suggestion! Thank you, yeah fingers crossed! Thank you for dropping in lovely! Thank you! And good luck with your goals! Thank you Kim hopefully I'll manage to complete them all! Good luck with whatever your goals are my gorgeous friend! Monthly goals are a great idea! I do my new years resolution and then forget about them ha. I guess this is a great way to keep track of your progress. I think I might give this a go too! I would definitely recommend giving monthly goals a try! Thanks for dropping in!